I'm rather partial to giving beauty gifts as I think most ladies can appreciate a little something to primp and pamper themselves with. And they're also my favorite type of gifts to receive as well. What are your favorite types of gifts to give and receive? The naked palette is perfect great gift selection. Have a lovely weekend doll. That UD set is really something! The reviews on it are great. i have 8 and love them! I have that Fresh one....it's fab! You have no idea how much I want those VB nail polishes, Rowena! I saw the review about it on another blog and there was a giveaway too but only for the UK and I nearly sob. I know many are not a fan of her but I actually like her, she's extremely stylish and seems like a hands on mum. Oh this is a fabulous selection. I would love to receive any of these. Great gift selection.... I love Naked palette!!! Nr. 10 is my favourite! I love beauty items. It's one of those things that you can never have too many of, lol! I got the Fresh lip balm set one year and love it. OMG Rowena, my favorite is the palette. Anna Sui has the cutest packaging! Yay! The Naked On The Run Palette is definitely something we wouldn't want to miss :D I love how sleek the packaging is, yet inside it consists of useful and wearable shades for everyday's look. The fruit hand creams and the gold brush set are my favourite! Ummm OK I see lots of gifts I want to gift to myself : O that brush set and Naked set oh my! I absolutely need the anna sui body powder! So cute! These are great picks! I love anything Urban Decay and I really like the lip products from Fresh. Cute picks, love the naked palette!! such a nice list! i would love to try that mist! Beauty products are always a good choice for presents if you ask me- at least when it comes to ladies. Besides them, I usually opt for jewelry, leather gloves, bags and valets. Occasionally, I will try sometimes more original, like making a gift myself...I think the most original present I ever gave was a vase made from tiny little stones...but it took me forever to make it! Beauty all the way for me and I'd be thrilled with anything here! I’m so behind on my blog reading (and my posts!) after a long weekend away and all the Christmas preparations! I've enjoyed catching up on your recent gift guides which are excellent. 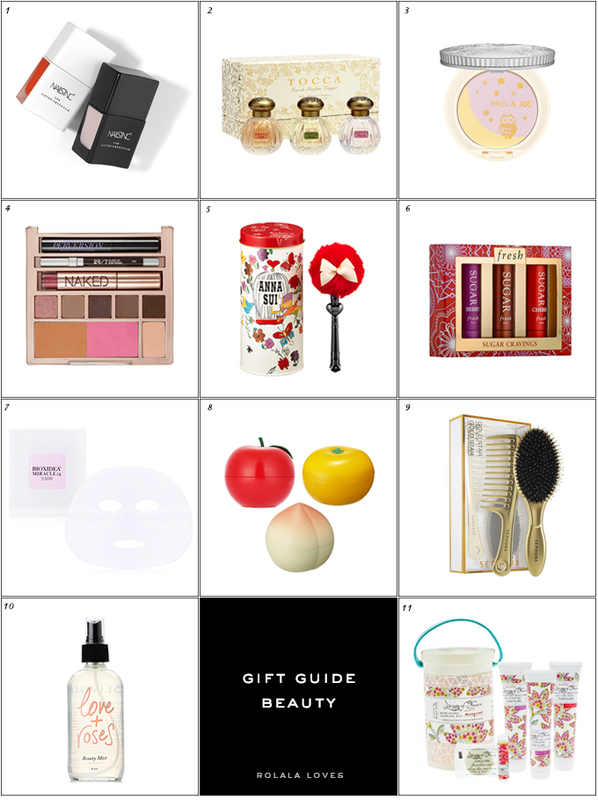 There are so many of these beauty products which I would certainly be happy to unwrap on Christmas Day! 'How to be Parisian' in your previous post would suit me fine too!